Which steamboat is featured in this view? 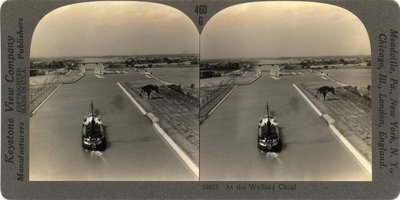 Stereoview of Foote Transit Company steamboat, F. V. MASSEY, making its way down the newly expanded Fourth Welland Canal in the early 1930s. This view is from Bridge 5 (Glendale Avenue looking north towards Lock 3. "460 G" "34053" "At the Welland Canal"
"Meadville, Pa., New York, N.Y., Chicago, Ill., London, England." "460 -- (34053) Geography Unit No. 19"
In order to make it possible for lake steamers to come all the way from Lake Superior to Montreal, the Canadians have built a number of canals. The largest of these is the Welland Canal, which connects Lakes Erie and Ontario. Locate the Welland Canal on your map. With what river does it run parallel? Why was it necessary to build a canal here? this canal is twenty-five miles long and has eight locks. These locks lift or lower vessels 327 feet. The new canal was opened in 1930, after seventeen years of work. The first canal was opened in 1820, and, at that time, from twelve to sixteen oxen pulled the ships through. It had been rebuilt and enlarged several times before this new canal was built. The present large canal was constructed because the Canadians wanted a cheaper movement of wheat from the West directly to Montreal. Some of their western wheat was going to New York, by way of Buffalo, for shipment to Europe. Why? Here we see a vessel passing through the canal. This canal is not only a waterway but also a source of hydroelectric power for the numerous manufacturing cities in this region. Copyright by Keystone View Company."